Part of the UNDERFOOT- PREHISTORIC BABIES exhibit features one of the original dinosaur egg incubators from Jurassic Park 3. I found it in a warehouse in Florida. 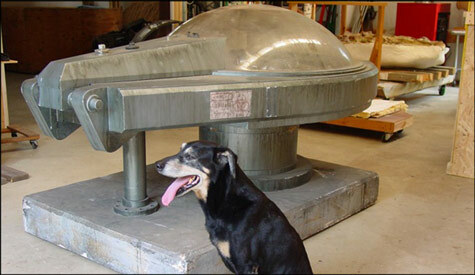 It was oozing with potential, excited for the outcome, we started the restoration of this famous movie prop. 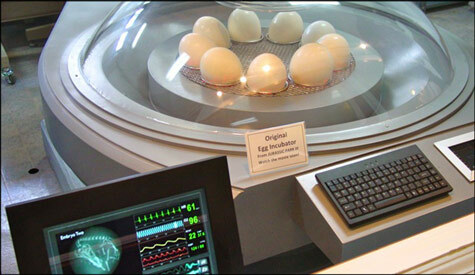 In the original movie the dinosaur egg incubator was made to look abandoned, as the dinosaurs had destroyed the laboratory and the jungle was taking over the facility. So what you see here is what it was originally made to look like. The neighbors dog, Ol' Strap, would visit my studio often to watch the progress. It has now been restored to factory fresh condition, complete with working monitors and special effects. All the original components were reused, but we added a special monitor to add scientific intrigue.